Syrinx woke up under a small overhang of rock, just before sunrise. She could tell due to the dim light and the soft sounds of night insects that were finishing their songs. With a muffled groan she rolled onto her sternum from her side, her large butterfly wings splayed out over her back so that they lightly touched the ground. Shaking her head, she forced herself to more wakefulness and stood up slowly, yawning largely as she did so. In all honesty, she had been used to sleeping in a tree so it wasn't as if this was very strange sleeping out in the sort of open like this. It was just weird sleeping on the ground, but there were no trees around large enough to hold her at her current size. Disappointing. “I think I rather quite liked it when I was smaller than everything around. I mean much smaller, of course. The still small, but not nearly as tiny as she had been, wolf spoke to herself as she padded out towards the small, shallow stream that trickled nearby. Hesitantly, she lapped up some of the life-giving substance, still recalling the events of the last time she'd gotten any more than simply her tongue into the cool liquid. Let's not try that again right now, shall we? At least not until she figured out what that had been all about. Maybe Corrdelia would have some ideas that she would bring back with her after her travels. So, while she waited, she did the one thing that she could still do even though she had no magic: flying. She was still a fairly small, petite wolf, and her butterfly wings were still rather large in comparison. Padding up to the top of the overhang, she grinned at the sky and then leapt into it, her wings moving quite rapidly to pull herself into the air. A gleeful expression was on her muzzle as she felt the wind rush past her silken fur as she ascended higher and higher over the land. Looking around in the now brightened sky as she attained a proper altitude, she barked her own elation at being airborne. "Wheeee! It's so shiny up here!" Sunshine on damp grass, the simplicity of a Summer morning, when the first trills of birds clear the silence in the air left by the chitter of night bugs. Reckitt is awake early this day, blinking drowsily into the first rays of light, the amber glow that peaks up over the edge of the world and paints faded shadows against the emerald fields. A yawn that ends in a high pitch leaves the confines of her ashen mouth, then she finds her feet to begin a morning stretch. It was one of many nights she spent out in the open, with only the cover of a tree or bramble to blanket her, there was no den for her to curl in- not yet anyways. All the same, it had become very usual so there is not much more thought given to it, save that a few stray leaves had snagged themselves in her otherwise white coat. She doesn’t bother to remove them, not overly fussed by appearances these days, there was too much to be done to waste on frivolity. Soon, she would need to touch base with Verona, they had chose to separate for a time, cover more ground to suit their cause. As of yet, it was working rather well, there was no lack of support, there was yet hope left for so many. Enough to make her smile, even now in the silence of her own company, as sleep cleared from the ducts of her eyes and she shook off the last remnants of night stiffness in her joints. Her own silence, until it was not so silent anymore, the excited chirping of something that was not quite a bird finding her pale ears. Not quite a bird, no, not a bird at all. The next rise brought her into a better vantage point, one to see just what was so surprisingly happy this day. What met her eyes, was something quite out of the ordinary, the bluest, NOT bluebird, she had ever seen. More of an oversized butterfly, yes, exactly that. This canine was adorned with the delicate painting wings of a butterfly, with hues of blue much deeper than the sky, and striking white markings. Whoever they were, they were happy, and that, that was enough to make Reckitt herself feel happy as well. “Good morning!” she yipped, bouncing a bit as she spoke, her front legs leaving the ground, as if it would help throw her voice. "Death must beget life, for otherwise, it is… in vain-"
The ominous voice of Nexus rung in her ears as she was suddenly jerked awake. It had been another mostly restless night as images from the Rift swam in her head. Corr could still see all the bones and even smell the stench of death. It had been the war all over again- a day she wanted to stop reliving. But then, they were shown what could be: a world reborn and all the pain finally dissipating. She had felt the magic return to the land and hope had returned. Finally, everything was properly balanced again and it was like a huge weight had been lifted. Back in reality, they were still far from this day, but it was good to know that not all hope was lost. It would take a good number of supporters, but Corrdelia was confident that Ourania could at last be restored. A group had gathered by the Rift after the vision was over and it seemed others had been visited by a similar force. She didn’t stay too long to hear, but she caught snippets. At the least, it seemed there were many on their side. This was good news for Corr as her new friend Syrinx was interested in something like this as well. When they first met, that had been one of their main pieces of conversation. The girl had been sad she lost her magic traveling here, but she was excited to help. Now, Corr felt a new sense of purpose and couldn’t wait to tell Syrinx all about her experience. She knew her friend would be just as eager to get started. It had been several days since she had left her friend by the stream; hopefully Syrinx wasn’t too worried. She didn’t mean to be away for so long, but she had to take some extra time to think before returning. The events at the Rift were so life-changing, she didn’t know where to start. The whole reason she had gone down there was based on a gut feeling, but now it didn’t seem to be helping her go into the next direction. Maybe some meditation was needed to clear her chakras. At last, the bordering forest of Varga was coming into view. The trees were so beautifully lit by the coming sunrise that it reminded her of fire. As much as the actual element made her nervous, she had to appreciate the colors. In truth, this area was beginning to feel like home and that was something she hadn’t felt in a long time. Her ears perked at the sound of a voice ahead. She could see the butterfly-like wolf zooming around excitedly and it put a smile on Corr’s face. She almost called out to her, wanting to spill everything that happened, when she realized that another canine was present. This one looked familiar… yes, they were at the gathering by the Rift. "Hey, I know you! You were at the Rift not too long ago. I… don’t think I actually caught your name, I apologize! I’m Corrdelia." She turned to Syrinx, practically grinning from ear to ear. "You’ll never believe what I’ve seen! Or I suppose, what we have seen?" Corr stopped, looking at the stranger wolf. It didn’t occur to her that this individual had a slightly different experience at the Rift. She assumed it was all along the same lines of restoring Ourania, but she supposed she’d find out soon enough. The wonders of flight were truly astonishing to the small wolf. Even while she had been able to attain these heights since birth, it was still each and every time, a marvelous experience and one she really wished she could share with others. Perhaps not that others might like it, she honestly didn't know if other wolves even enjoyed heights like she did. As well, it wasn't as if she had any magic any longer that would allow for that, and she wished yet again that she had access to her former powers of the air. Well, perhaps some day they would return to her, and all she could do until then was just stay the course here in these lands. There most certainly had to be more to life here than she had witnessed so far! Her cavorting and fluttering was interrupted rather pleasantly by a chipper bark from the ground. 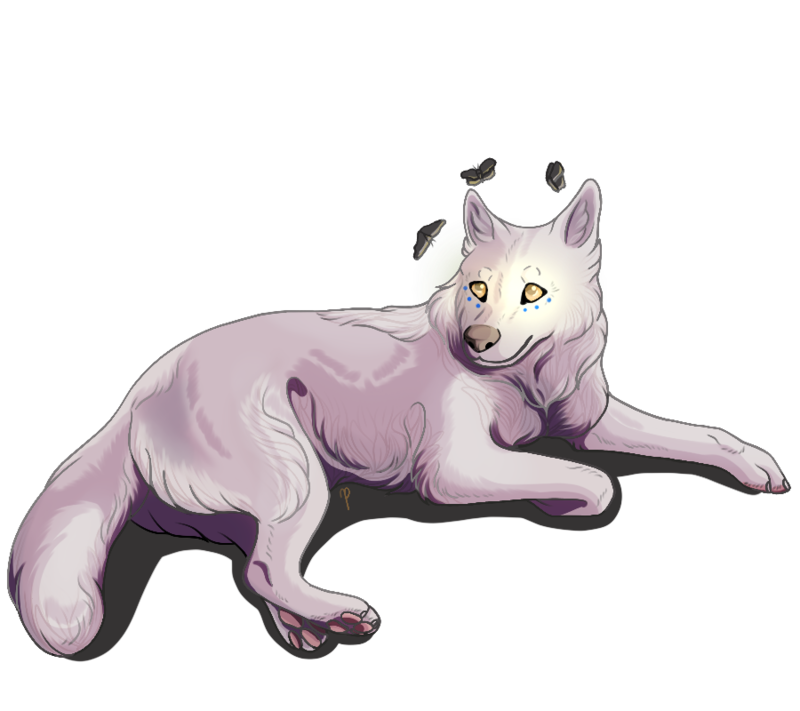 Looking in that direction she saw a light-colored blob moving about, seeming to hop up to get her attention. With a grin, she called back, flying closer so that she would be more easily heard. “It is a good morning! Hey there! I'm Syrinx, and it's really nice to meet you! You must be a traveler through these parts as well? Have you lived here all your life? 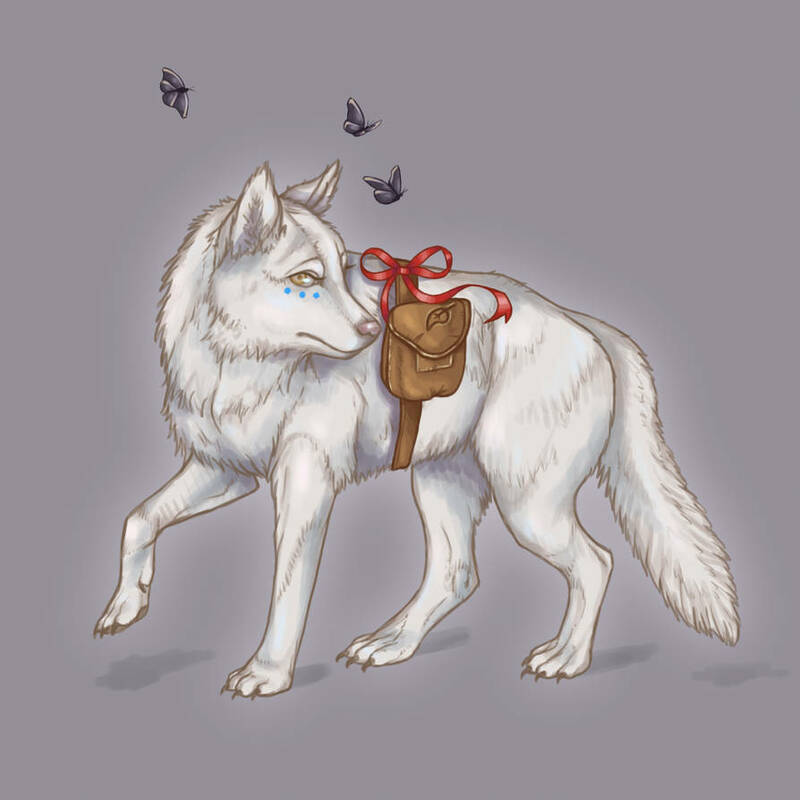 I'm still pretty new here.” The small butterfly winged wolf barked happily, in greeting as she came to a descent, her paws touching down on the ground. Even as she landed, she realized another had arrived and she beamed brightly at her friend Corrdelia, who had returned. Well, this was a quite happy occurrence then, a hopeful new friend and the return of another! "Oh hey there! Yeah, you should tell me all about it, it's probably really cool! I think I recovered from that stupid thing with the water, but anyhow, that's not something I'm going to worry about now. And you saw it too? Neat!" Syrinx trilled happily, looking from familiar wolf to unfamiliar wolf, hoping that between the two of them she would find out whatever this thing was that had been seen and she'd missed out on. Her long tail twitched behind her as her ears canted slightly forwards with interest at the two of them, eyes bright with curiosity. Reckitt hops up, moving her weight to her back legs, springing only inches into the air. A gentle breeze coaxes her fur to sway, blowing the snowy hair to an fro, and she enjoys the gentle brushing of the air. With bright eyes, she watched as the winged wolf fluttered carelessly about the breeze, elated with the practice and joyful in her aerial movement. There was nothing to stop her as she went, save for a fluff of cloud or a bird bent on its own path to find a perch in the nearby tree cover. If Kitt could fly, she wondered if it would make her that happy as well, but it was enough to warm her heart just watching, carefully tracing each flick of blue wing. “Hello!” she calls again, shouting to be heard, but it is then that the other lowers altitude and sings warmly in return. It would seem they both were chipper this day, praising the Sun and the calm that took the the valley of Varga, so much so that she isn’t sure who exactly is in the better mood. This, this was her kind of wolf. Many words greet her silver ears, the two that stand proud and alert on top of her pale head. Lived here all her life? Certainly not, she was still a pup in the ways of this unusual and Magical realm. Ourania, with it’s strange Magic and curious creatures, where she learned shortly that the wolves and the horses did not always see eye to eye. In fact, the quarrelled so much that there had been bloodshed over the fact, that, that had to change. “I’m new as well, mostly new, been here for a turn but I wasn’t born in this world.” In this world, because with certainty, this was not the only one to live in- that much was sure. With a grace unknown to the Druid, the butterfly lands, touching the earth with an ease she herself had never mastered. Then they are joined by another, a shorter, darker wolf, with feathers fanning about her neck and friendly greeting. These two knew each other, the new arrival perhaps knowing her as well, and that set Reckitt at ease. The Rift, yes, she had been at the scar of the earth, the great wound that spanned for miles and had been covered in vine and bloom last she saw it. “That I was,” she nodded, thought the nod is solemn and quiet, as it should be for such a topic. “My name is Reckitt, it’s nice to meet you. To meet both of you actually,” she said brightly, turning her head between the two, paying them both close mind. Share their experiences of days past, she nodded, the tale was not a happy one, but perhaps necessary nonetheless. “Funny you should speak of the Rift, some have a mind to make change in regards to it. Wolf and Equine alike.” A seat is taken, finding rest on her back legs, the vivid light of her eyes patiently waiting for the story to unfold. Syrinx had landed on the ground now, practically beaming from the sight of the two wolves. The new wolf seemed to have a similar demeanor to her friend, and Corr had a feeling the three would get along very well. At mention of water, Corr's focus changed for a moment and she walked closer to Syrinx to examine her just in case. The poor girl had a vulnerability to water, much like Corr's vulnerability to fire. They had learned the hard way recently by the stream, but thankfully it did appear that she had recovered well. "Mmm yes, vulnerabilities are tricky things. Suppose it's the trade off for the whole immortal thing in Ourania. The Gods didn't want us to get that much of a free pass apparently!" She said while finishing her examination. "Yes, you do appear to be okay, my dear. Let's just be careful from now on!" She turned to the new wolf who introduced herself as Reckitt. Now it was nice to have a name to a face rather than calling her "stranger". "Funny you should speak of the Rift, some have a mind to make change in regards to it. Wolf and Equine alike," Reckitt said while taking a seat. Corr sensed it was story time and she began to dance in place. "Ooh! Ooh! I want to tell the story! I love telling stories!" she chattered, her eyes getting wide. Then she looked around and realized one other individual was missing. "Wait, let me get Hāsta. She would want to hear about this too!" Without another word, she scampered off to find where the bird had run off to. She had left her behind during her travels, both because she felt it would be safer and also the crow would complain the entire time. It wasn't worth it overall, so it was just best to leave her here with Syrinx. Corr found her sitting by the same tree she had left her at and the woman rolled her eyes. "Still here sleeping, I see? You know, if it wasn't for me, you would never go out anywhere." "Yeah, it'd be much more relaxing, that's for sure." "Oh hush, we have important matters to attend to! You're coming out and meeting this nice wolf and hearing about the things we've seen." Corr picked the crow up and brought her out to where Syrinx and Reckitt had settled. She placed Hāsta near her and ignored her grumbling. "I hope Hāsta didn't give you too much trouble while I was gone, Syrinx. She can really be a handful!" Corr said after taking a seat, her dead stuffed crow sitting at a slight angle next to her. Of course, the woman didn't pay any mind. "Alright, where should we start?" she began, turning to Reckitt with a childlike excitement bubbling inside her. "Well, at least with my group, we had gathered by the hot springs of Vulcanis and were led down a tunnel by a Rabbit guardian. He brought us to this hidden room with an altar and we received a powerful vision from a spirit named Nexus. It was what once was, and what shall be. She showed us the war again and the aftermath…" Corr explained, turning to Syrinx now. "Bless you, for not being there. I wouldn't want you to have witnessed that!" Then she looked back at the ground, trying to refocus her thoughts on the better parts of the vision. "But then we were shown a world healed and full of life! And magic! It was beautiful! I think that was a message - we need to rebuild Ourania and restore it. We need to mend the Rift and all will be balanced again. Also -"
She paused, pawing through her satchel to reveal the hare totem she had received by the end of it. "All those in my group received one of these. I don't know what it does but I think it's a gift from the Rabbit guardian somehow. Did you get one of these too, Reckitt?" Now that Corrdelia was mostly done telling her side of things, she was very eager to hear what Reckitt had to say. She assumed she had a similar experience, but they had all been called to different areas near the Rift at first. It was a strange summoning indeed. Syrinx paid attention to what the white wolf said, tilting her head as she nodded. So this wolf as well was not one that had been born here. Well, what was this land all about then that it somehow garnered the attention of so many? However, that was fine for her, since that meant many new friends for her to meet, as was exhibited by this pleasant female whom was just as pleasant as could be! She beamed at her and greeted her more properly now that she had given her name. "Reckitt, it is very nice to meet you!" She bowed her head a bit to her politely as she did. Corrdelia’s notice did not go unnoticed and she chuckled a bit agreeably. "Well, I suppose that would make sense. Although I’m not sure how I feel about being really immortal, honestly. It feels weird! And yeah, thanks for checking, though." She merrily spoke, nodding to Corrdelia. Then, the two seemed to get down to business about whatever they were talking about. The Rift, was it? However, Corrdelia had to get the bird first. Off she went and when she returned, she queried whether she’d been any trouble. Syrinx, by now, had well figured out that the bird was well, just a stuffed inanimate object. 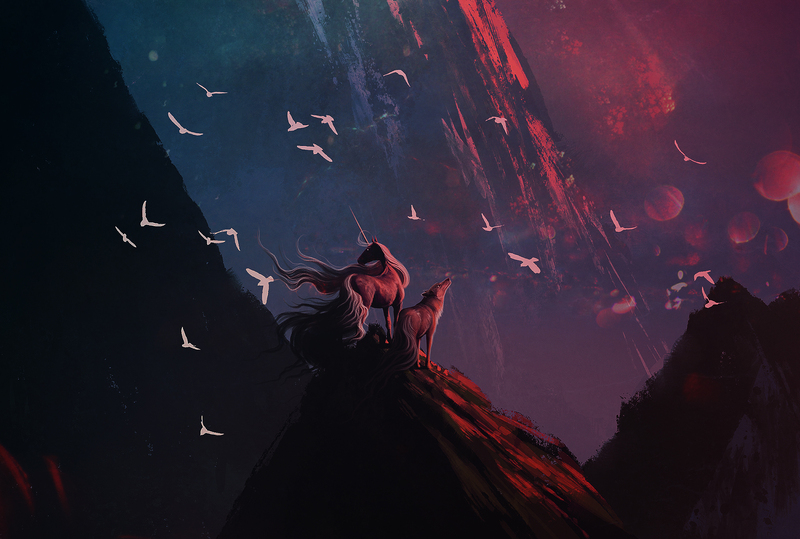 It didn’t even have any tingly feeling like the magic that the two wolves had found back there, so she had determined that it wasn’t even anything like that. Still, though, it hurt nothing at all to play along. "Oh, no, she basically sat by the tree and looked annoyed the whole time. I think she missed you." Then, the small wolf turned her attention to the story about to unfold, as she saw Reckitt as well, get in position to listen. Her facial expression slowly became more and more awed as the story took place. She too, nodded when it was mentioned it was good for her to not have seen the war. Syrinx already knew she wouldn’t have liked it much, and honestly, it might not have left a good impression on her after all of that. So at least fortunately there were those whom had seen and could tell. The little totem thing made her get closer to look at it curiously. "That’s pretty cool! You know, I would like to help things have life again, if that’s something I can help with. If you think it would make it better here and stop anymore wars." Nodding very seriously at that, she looked to Reckitt as well wondering what she had to add. She finds a seat on the cushion of the earth, the emerald grass beneath her paws was a welcome padding, it was enough to make her sigh- ridding herself of stress. Taking her time to settle in, Reckitt turns a small circle, adjusting, there was no hurry to be found here, this company was exuberant but not pushy. Needless to say, she was keen on them, soaking up the excitement in which they spoke, the hurried spinning of their words and telling of their tales. Their gathering was made concrete as they each closed in, passing words and names, offering friendship so readily- she could beam now, if it were possible. Syrinx and Corredelia, she would save these names in her memory, silently repeating them in her thoughts as they continued to speak. The butterfly, the crow and the dove, what an eccentric clan they were, growing in number by the unmoving form of- nevermind, a stuffed crow, she raised a quizzical brow. Kitt didn’t quite understand but she did not push the subject, rather she nodded simply at the presence and pretended not to find it peculiar at all. The word struck a chord of uncertainty within her, and she blurted out a thought before she realized she was speaking. A strained question, traipsing on fear and collapsing into the unknown. “Wait, what do you mean immortal?” Certainly, they were joking, they couldn’t be- she couldn’t be. A long pause follows, her glowing eyes finding the ground, needlessly tracing petals of weeds and looking away from the others. There were no words to say how she felt about that knowledge, she really didn’t know, how does one accept the endless fate of existing- forever? Silence takes her, until she is asked a question, Kitt is content to listen and consider the differences in their journeys. Both had the same conclusion, essentially, the Rift should be mended, the world remade and renewed. “We came here,” she looked over the hillside, eyes drifting to the edge of where the Rift lay in wait. “Called to enter the chasm, faced with the faces of the Dead, but I- I did not enter the dark. I stayed, I wanted to help them, but it’s too late to help those already parted from this world.” A heavy burden that day, yet she bore it with grace, lifting her chin and saying true her words. “I was only given a thread,” turning her head to her satchel, the leather pack at her side, from this she pulled the crimson twine. “The thread and the orb,” she whispers, not knowing how much was too much to say. “All I know is, we can make this change. If we work together, won’t you come?” Again her tail wags, springing to her feet with the offer, unable to hide her excitement. At the mention of immortality, the white wolf seemed confused, which made it clear to Corrdelia that she was not from this land either. "Ah, yes, all those in Ourania are granted immortality. I thought it was only those who were born within the land, but it appears that this gift is given to those who travel here as well. Syrinx is a traveler too, so like I told her, if you don't want to be immortal, I would leave now. I imagine the longer you stay, the worse you'll feel when you leave… I don't think the natural aging process will be too kind to you," she explained, then pointed to herself. "Like me, I'm a hundred years old, but as soon as I step out of this border, I'm probably going to shrivel up and turn to dust! That doesn't sound very comfortable." At the end of Corr's story, Syrinx let them know she would be on board and it could be assumed Reckitt would be as well. Before the new wolf started her version, Corr added to what she said earlier. "You know, I didn't mean that you had to leave. I think it'd be good if you stayed - both of you! It's a scary concept at first, the whole living forever thing, but you get used to it! It has its perks. I mean, at least you're not the only one around," she said, attempting to find the silver lining in the situation. Then it was Reckitt's turn to tell her story and Corr twitched her paws with excitement. It seemed she had faced a very different experience and it was quite intriguing. Being able to communicate with the dead was an ability she had secretly wanted some time ago, but she had forgotten. Now, she could see how it might be useful, but also difficult. She could tell from Reckitt's expression just how tough it must've been. It was towards the end of her story that she pulled out a piece of thread and Corrdelia tilted her head at the sight. So they both received an item… what did it mean? 'The thread and the orb?' Reckitt did not explain this in detail, but asked if the two of them would work with her to make the change. "Yes, of course!" Corr replied immediately. As Syrinx had already showed her excitement for helping earlier, she was sure the girl would join in whatever group Reckitt may be gathering for this cause. It made the woman elated to see that her dream was finally coming together. There was always a pull to help the land and restore it, but never any clear picture of how exactly to do it. Now that this event had happened, it was becoming more possible. "Do you know what the thread is for? And what the orb is that you mentioned? Was it one of those magic orbs floating around that helps restore magic? Oh, wait, you probably don't know about that. Well, when the war happened, all the magic was scattered across the land and now little orbs float about as remnants of that magic. If you encounter one, you can gain some magical powers," Corr explained, then pointed to Syrinx. "We encountered one and it made Syrinx's head disappear! It was actually quite terrifying, but she fixed it… somehow. I'm not sure what power I have yet but it's not anything I'm familiar with…"
Her mind wandered a bit, thinking back on the fuzzy feeling she had felt when the orb was absorbed into her body. There had been no immediate reaction like Syrinx had, so maybe her power would take more concentration to figure out. No matter! She didn't need magic to start helping Reckitt and the others, just a can-do attitude and the knowledge she already had in her head. It would be interesting to see how this would all play out, but she was very eager to get started. "I was the shaman in my old pack, so I would be happy to lend a hand for your cause with my skills as well!" she added with a nod. Healers would be important to have, especially if they were forming another pack and there were those who didn't agree. Corr prayed that another war wouldn't happen, but if there were those who wanted to help the land, there likely were those that still had the need to fight again. Syrinx had felt weird once she'd realized the immortality bit, she'd gradually started to feel a bit different ever since she'd entered the lands, but now having stayed for quite a few days it was easy to feel. It was like a strange sense of just not aging, not that such a thing made much sense, and she nodded at Reckitt with a shrug. “Ah yeah, I'm not from here but I realized it around the same time I realized that water touching my fur creates pain. That's new too, I think it's all connected, since I'd also lost my initial magic since coming here. But you know, well, I'm here now and I don't see the point in wishing I could go back. I must be here for a reason.” The small wolf said with determination in her tones. She had, after all, started to realize that with what she had learned so far, that this world was in need of something. Was it in need of wolves to help it be better again? From what Reckitt and Corrdelia said, maybe it was! That was something she could help with, after all, Syrinx knew she was great at helping! That Rift sounded bad, something that was in need of being helped, and she figured it would be ok if she helped with that, at least from what the other two spoke. The thread that the white wolf pulled out seemed very strange to have but she accepted it, as she was starting to do with everything else, as simply another part of this world that was different from the one she was from. "I . . . I was a scout in my old pack. Kinda like a watcher and finder of stuff. I"m not really sure really, mostly I just went on explorations with other wolves to find new things. But you know, I can help however I am able. I think I did get some magic back when I found the glowing pink orb but I'm not sure if it's just supposed to make my head disappear or what." Syrinx really had not gotten the chance to try it out much yet. The rest she'd had in the makeshift den had been recovering from her travels, use of the magic the first time and also the strange reaction she now had to water. However, now she was energized and ready to help with this plan that the other two seemed so bold about. Then, something rang a bell in her mind, something aforementioned but that she hadn't really paid attention to. Equines. Something that wasn't a wolf, and that she felt like should be familiar but wasn't. Hesitantly, she broached the subject, wanting more clarification. "Also, you mentioned . . . um, equines before? Ah, I can't say I've ever met one, not really. I'm also not sure what they are . . . exactly." Syrinx grinned a bit sheepishly, her wings fluttering in a bit of a nervous tic, unsure if she had just said something entirely idiotic or not. If they were just a different type of creature she could be friends with, that would be ok, wouldn't it? There were odd occurrences, questionable healing (the cut on her chin for instance, it was gone so quick, too quick) but she didn’t think long on it- she hadn’t had time to really. Nothing to do but accept it,s he supposed, still, it wasn’t something she could easily come to terms with- this changed things. Immortality, how long would she be here? Her family, they would be gone before she was, long gone, and going back- that wasn’t an option now, she’s been here too long. Kitt didn’t know how to get back,even if she had wanted to, but she had a purpose here- she would see her task through. “I-” she falters because she is unsure, “I’m not sure what it does, everyone has one from my side of the Rift.” It would take time to figure out the use of the thread, what it meant, perhaps it was a marker of sort, something to identify them. Then the questions turn to the orb, she hopes she can trust them, they’ve done nothing to make her think otherwise. “It was beautiful, full of stars and swirls of color. I couldn’t help myself, I’ve seen another, the one that made me turn invisible, but this- this one was different.” There were simply not words to describe the divine orb, or maybe their was, words she didn’t know, a language she hadn’t learned. It was something easier to show, than to tell, but here in the empty meadows and rolling hills, there was nothing to mend- it would have to wait. The Druid offers them a place, a meaning to the ordinary day to day of what they called life, a purpose, same as her. If they could all come together, if they could mend the Rift somehow, then maybe, just maybe, they could restore Ourania and make it a better place for all. Come with me, join me, she asks them and they say yes, of all things, they say yes. Springing to life now, rising to her snowy feet and looking at the other two with elation- pure joy. If this wasn’t luck, she doesn’t know what it! In fact, Reckitt could chalk up the majority of her stay to luck, good fortune, there was nothing else to call it. Standing here, wide eyed and waiting, she could not wait for the confirmation and readily rushes to lick their faces as the words leave them. “Oh thank you, thank you, thank you,” thank you wasn’t enough, thus the licking and over zealous gratitude. They did not know just how happy they made her, or maybe they did, they could probably guess just by her display of affection. “Absolutely, eyes in the sky, that will be most helpful,” she tells Syrinx, admiring the delicate wings that sprout from her back. “You will be perfect for that!” The butterfly would, she really would. “I shaman, oh I like that! I was a healer, a caretaker in my old pack, it would be lovely to work together.” A broad grin forms against her silver lips, and she presses her cheek to the cheek of the dark crow, a fleeting touch, not wanting to overstay her welcome and cause discomfort- she was just so happy. “You’re both wonderful, just wonderful. We still have some planning in the works, still looking for the perfect place and gathering others.” Work to do, oh yes, about that, that’s what she had been doing this whole time now wasn’t it? "Equines, well, they're horses. Big things on four legs, with broad chests and long faces." Long faces, she often thought of them as that. "They have dull teeth, short fur but long hair on their head and on the, well, their rump. Their hooves, they don't appear as much but their hooves will knock you silly if they wanted." Not that anyone of the horses she knew would do that, but it was good to know about being careful, Kitt didn't want anyone to get hurt for some sort of misunderstanding. Reckitt wasn't sure what the thread did, just like Corr had yet to find out the purpose of the hare totem. "Well, no matter! I'm sure both of these items have a purpose and we'll find out what it is eventually. We'll just need to keep them safe in the meantime," Corr said, putting her totem back in her satchel just in case. For this, it would make sense to be a symbol of the hare guardian, but it had to be more than just a pretty thing to look at. The way Reckitt described the magical orb was intriguing and Corr hoped she might encounter one that looked like that some day. The one her and Syrinx found was pale in color, still mesmerizing, but not as pretty as this one sounded. "I must be here for a reason," was what Syrinx had ended with when speaking about her experience in Ourania so far to Reckitt. The saying resonated with Corr as she always believed there was a reason for everything. There was a reason her and Hāsta ran into Syrinx along the mountains, and now here they were offering their help for Reckitt's cause. It was all slowly coming together. The white wolf sprung up and began licking their faces with an expression of pure happiness. Corr laughed and wagged her tail; it was a surprising gesture, but she was happy that Reckitt was happy. The girl gave many thank yous to the pair afterwards. "Oh you're welcome, dear! It's our pleasure. Really, this was what I had in mind for some time, but I didn't have anyone else to help me. Now, I'm glad I found you both!" Corr barked, her tail still wagging. It sounded like Syrinx would make a good scout and, like Corr, Reckitt was a healer. "I would be delighted to work with you! Maybe we can learn a thing or two from each other. I do love to teach others." It had been so long since she had a mentee and she truly missed it. From the sounds of it, the group was not fully formed yet, but that was alright. "No worries, you know where to find us when everything is ready!" It would be exciting to meet other like-minded individuals. She could feel herself growing restless the more she thought about it. Then, Syrinx innocently asked the question about what equines were. It was pretty adorable and Reckitt answered before she had the chance. When she was done with her description, Corr nodded and added her two cents. "Yes, definitely be careful! Not all of them take too kindly to us, so just be cautious if you ever see one. Watch their body language - if they pin their ears back, run!" Corr briefly thought back to one encounter she had and it didn't end very well. Listening to the happy and hopeful Reckitt, Syrinx was pleased that it seemed her offer to help was so readily accepted! As she was licked joyfully, she returned the gesture in kind, not minding the overt familiarity. Why, it seemed as if they were all a pack at this point already even though they had just met! That was how much it seemed to the small wolf that their ideals had synched up since their just meeting. Pleased as well that it seemed that her help would be needed for the pack she knew this was clearly, why she had been brought here. Even while she missed her old home, this seemed like such a great new adventure that she could hardly contain her smile and wagging tail. “Oh yes, and I am sure that we will gather many others as well don't you think? I mean, I am quite sure there are many that think as we do and want things to be peaceful. Wars are rather nasty, so we should work together to make sure they don't happen again! ” She was quite optimistic that this would all work, the overabundance of optimism that exuded from the white wolf was palpable in the very air around them so it made her quite sure of it. Corrdelia as well, seemed quite on board with all of this too, and that made Syrinx even more pleased, she knew she'd gotten a good impression from her when they'd first met. It was as if there was some sort of fate that had brought them all here. Then, on to Syrinx's burning query about what an equine was. As the description came forth, the small wolf squinched up her expression a bit to try and imagine them. Four legs, a long face, and um, long hair on their heads and butts? So they didn't have tails like wolves? Or were the tails the hair? She supposed maybe she'd just have to see one to know it, and she took in the thoughts about whatever hooves were and if they pinned their ears back, as cautionary statements, nodding. "Ok. Well, I think I might be able to tell them from a wolf, at least! I'd like to meet one, but only if it's in a nice way. I mean, I don't see why we can't all be friends, right?" She beamed at the two of them, pleased to have found such good friends. She sure hoped they'd meet the others that would form this group soon as well, she certainly knew that she needed to be with some sort of pack, Syrinx wasn't one to go it on her own. "Yeah, I mean, I certainly don't mind traveling to see more of these lands while I wait, of course! They're so different from what I'm used to. But I'm ready whenever the group forms. " Syrinx said rather decisively, looking at both wolves as she did so. Concern lines her features, draws furrows in her too young forehead, makes the corners of her lips droop. A bowed line of angelic down, the curve of a frown that looked displaced on the Druid’s face. It was not a pleasant topic they had delved into. Reckitt felt bad for cautioning the others, necessary caution but there were thin lines drawn between the two species here. Lines she herself has not seen, each long face had welcomed her, shielded her in some cases. The horses had been anything but caustic. Verona, she had led her through the terrain of red rocks, made sure she was safely out of Feral Rim. There was no question in her eyes, she simply did the right thing, swaddled her in safety without blankets- but words, actions. The first of their pack was forged that day, without their own knowing perhaps, something to belong to. First spoke to the wheel. Reckitt had been told that there was War between their kind, that day, she could not fathom it possible. Klaia, horned, the sharp crooks of her thorns did not cause Kitt unease. The chestnut haired mare was friendly, intelligent, so easily did they band together to overcome an obstacle. It was just a few combs of honey, or was it? That day she saw possibilities, what could they overcome if used their combined talents, if they were not alone to see the potential in kinship? A bow is given after she pulls away, a nod of thanks, they both have agreed and she could not be more pleased. This world was truly an inspiration to her, she hoped could accomplish even a fraction of what they hoped for, and now, it was truly starting to look up. There is a certain strength in numbers, in the reliability of a pack. Pack, she wondered if that term was appropriate, suppose for now it was. “I will call,” she promised, she would let them know when they were ready. “Loud and clear, do not worry!” More often than not, Reckitt was good on her promises. Corrdelia admired Syrinx's fearlessness, although she would need to keep an eye on the girl and make sure she wasn't just super naive. She was sure that not all equines were bad - she met her fair share of nice ones - but it was hard to tell where everyone stood these days. At least they had found a friend in Reckitt and soon, a whole family to join. She could hardly contain her excitement. "I'll be ready too! Just say the word," Corr added with a nod. Reckitt bowed to the two of them and assured them that she would make the call once they were ready. Hopefully they would not need to wait too long, but for now Corr could always show Syrinx around to other areas within Ourania. It was sad to see their new friend go, but at least there was the comfort of knowing it was not goodbye forever. "Soon, Syrinx! I can hardly wait. Well, for now I suppose we can go get some supplies. I will need to be fully stocked if I'm going to be a helpful shaman!" And with that, Corr secured her satchel and headed off, gesturing for Syrinx to follow.